She was born September 25, 1934, in Franklin, Indiana, to George and Anna Mae (Gutgsell) Miller; and married Eugene F. Denning on January 20, 1965, at St. Mary’s Catholic Church in Huntingburg. She was a factory worker, having worked at Gossard’s Ladies Apparel in Huntingburg and other local factories. Norma was a member of St. Mary’s Catholic Church, the Daughters of Isabella, Huntingburg Fraternal Order of Eagles Auxiliary, and V.F.W. Post #2366 Auxiliary. She was preceded in death by her husband, Eugene F. “Bud” Denning, who passed away November 16, 2011; her son, Kenneth “Tree” Merrimon; one grandson, Heath Jacob Merrimon; her parents; and one brother, Charles Miller. Norma is survived by her daughter, Teresa (Larry) Lechner of Stendal, Indiana; one brother, David Miller of Oklahoma; two sisters, Peggy Bowers of California and Jean Miles of Tennessee; (6) grandchildren, Ernie Fawks, Nick Merrimon, Racheal Leighty, Adam Merrimon, Shawn Parks and Rose Schoppenhorst; and (19) great-grandchildren. 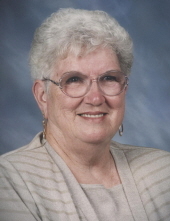 A funeral Mass of Christian Burial for Norma J. Denning will be held at 10:00 a.m., E.S.T., on Friday, April 5, 2019, at St. Mary’s Catholic Church in Huntingburg with burial to follow at St. Mary’s Cemetery. A V.F.W. Post #2366 Auxiliary vigil service will be held at 6:30 p.m. and a parish rosary prayer vigil will be held at 7:00 p.m., both on Thursday evening, at the funeral home. "Email Address" would like to share the life celebration of Norma J. Denning. Click on the "link" to go to share a favorite memory or leave a condolence message for the family.